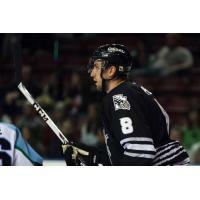 West Valley City, Utah - The Utah Grizzlies (34-26-5-3) defeated the Alaska Aces (34-27-3-4) 4-1 Friday night at Maverik Center. Utah now holds a one point lead on Alaska in the standings entering Saturday's contest. "Proud of the boys effort," said Head Coach/General Manager Tim Branham. "I thought our defensemen played really well, same with Bobkov." Goaltender Igor Bobkov improved to 17-12-2-0 by stopping 37 of 38 shots and held a shutout until the final 1:55. Bobkov stopped six special teams shots in the first period and nine overall to keep the game scoreless after one. "Our best players were our best players tonight, that's for sure, especially on the back end," said Branham. "Weller, Pelech, Boe and Fienhage we're phenomenal tonight battling it out." Utah scored three goals in six minutes and fifty seconds in the first half of the second period to break the scoreless tie and take a 3-0 lead. "It was pretty intense. We needed those two points. 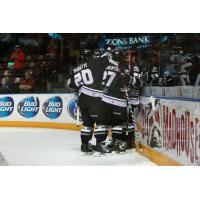 It was a pretty emotional game," said Danick Paquette. "The game tomorrow is huge. We need those two points." Utah made it 1-0 3:14 into the second period on a Danick Paquette goal as he threw in a shot from the right wing wall after captain Channing Boe fired it in from the left circle after a face-off win. H.T. Lenz also picked up an assist. "I think Searfoss did a good job in front of the net creating traffic and gave me an open net," said Paquette on the first goal. 5:10 later at 8:24 of the period, Brenden Walker made it 2-0 on his 22nd goal of the year as he took a great feed from Alex Krushelnyski in transition and slammed the puck home going hard to the net on the power-play. Mathieu Aubin also added an assist on the goal. The Grizzlies made it 3-0 1:50 later at 10:04 as Krushelnyski (16) took a feed from Aubin and scored on a breakaway sliding the puck in. Connor Hardowa also picked up an assist. Ryan Hayes scored his 29th goal of the year into an empty-net with 53 seconds left in regulation with Matt Pelech picking up an assist in his first game after returning from Rochester of the AHL. "It's great to be back here, back with the fellas," said Pelech. "We have a huge weekend ahead of us and have a job to do." With one goal and one assist Krushelnyski had multiple-points as did Mathieu Aubin with one goal and one assist.